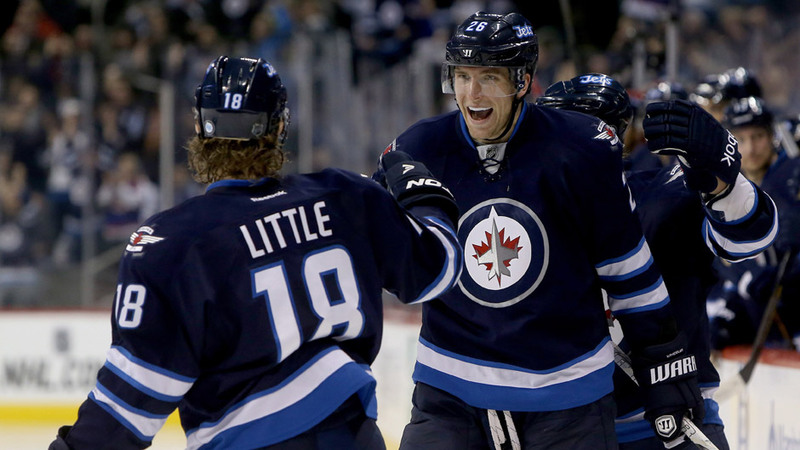 Now that the World Cup tournament has come to an end, all eyes are set on NHL opening night. We saw many goaltenders sporting new masks in Toronto representing their countries, but now our attention has shifted back to the rest of the regular season. A number of new masks have been unveiled for the 2016-17 season, so let’s check out what we’ve seen so far. Keep checking back, as we’ll continue to break down more masks as they’re revealed, and while you’re at it, check out the Eastern Conference masks. 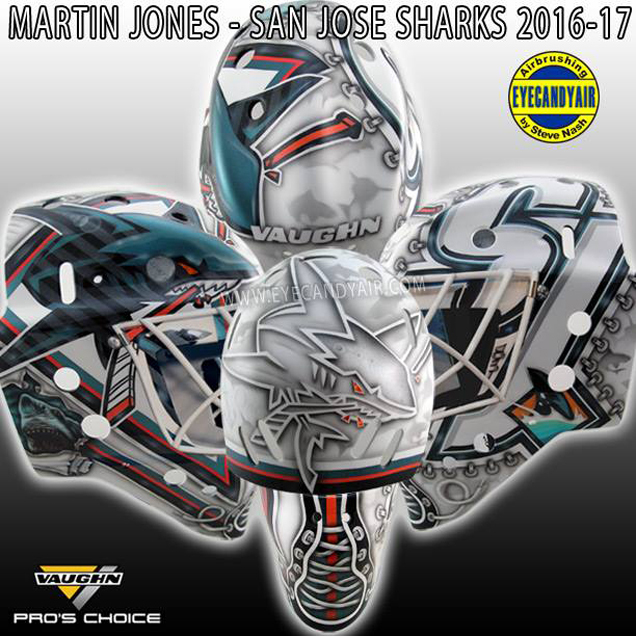 Following up on a fantastic 25th anniversary mask last season, artist Steve Nash is back with another stellar design for Martin Jones. Similar to last season’s design, Nash took a logo-based approach with minimal pops of color, making the full turquoise shark leap off the side. 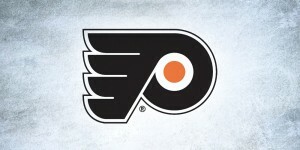 The alternate “SJ” logo appears more subtly on the left, surrounded by a light gray stitching effect. Complimenting the stitched trim is the lacing up the chin, also a repeated element from last season. 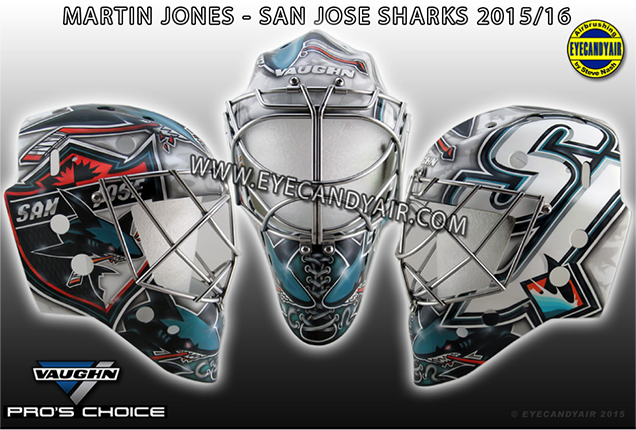 The rest of the mask features less prominent visuals like a simplified shark logo on the backplate, blurry shark silhouettes “swimming” through the negative space and metallic striping overlaid on the right side. I’m a big fan of this design, as it’s fully Shark-centric and highlights the team’s visual history. 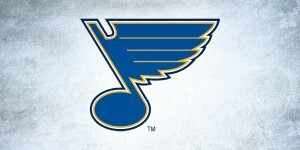 Fortunately, the new alternate logos were left out of this design (perhaps on purpose, or maybe the mask was started before they were unveiled) as they look a bit minor league-esque in my humble opinion. Staying true to his “Jake the Snake” moniker, Jake Allen went with a retro racing-style for the Blues’ 50th anniversary season. Painted by artist Jason Livery, the mask is a bit of a hodge podge color palette-wise, using a mixture of light blues, navy, yellows and grays. The snake and music note logo are the primary focus of this design but unfortunately don’t pop as much as they should due to the busyness of the background. Livery shared on Twitter that Allen wanted the horizontal stripes incorporated to match with his pads, but perhaps the variety in colors and gradient effects is where this design goes overboard. From a distance, the fine details in the snake, light flares over the note and the screened back 50th anniversary logo will get buried in the abundance of color and pattern. Quebec-based artist David Leroux has a knack for making crisp, clean mask designs, and Hutch’s mask for this season is no exception. 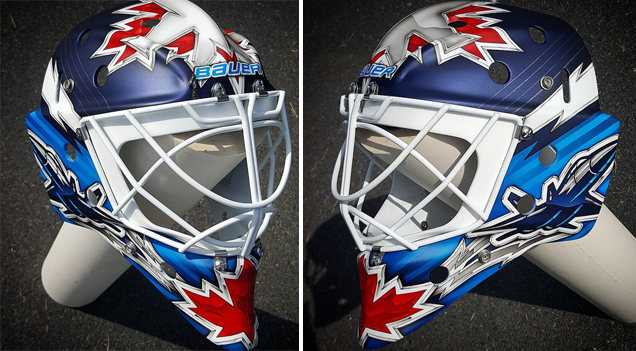 Not unlike the Winnipeg netminder’s mask from a few years prior, Leroux’s latest design is all about the Jets’ brand. The matte paint finish is a trend we’ve been seeing more of recently, and I’m a big fan. It works really nicely with this graphic style, and Leroux even added small touches of shine in thin stripes on the dark blue areas. The lack of sheen lets the design take center stage, and there are a lot of really nice details happening here. The contrast between the matte texture and faux-chrome effect is really sharp and consistently carries through the entire design. The red maple leaves on the chin and top draw your eye right to the middle and help create a dynamic composition even with a minimal number of design elements. Since moving back from Atlanta, Winnipeg’s jerseys have a clean, contemporary look, and this mask coordinates perfectly with that aesthetic. 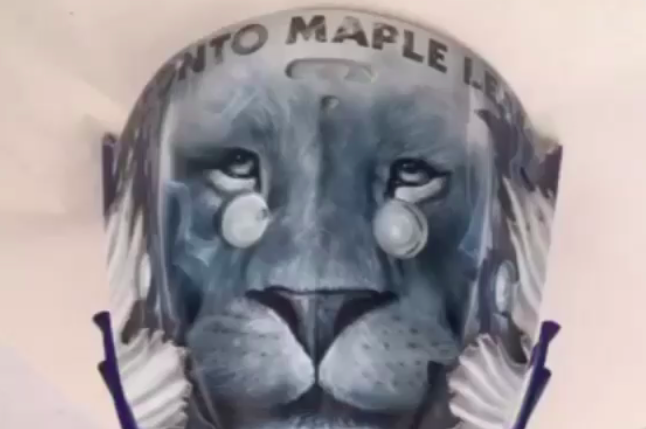 Almost identical in composition to Bernier’s 2015-16 mask in Toronto, the lion (Bernier’s zodiac sign is Leo) sits on top of the mask surrounded by the Ducks logo on each side. 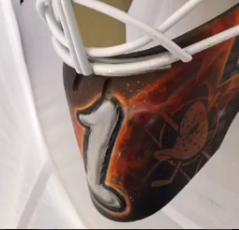 It appears that Bernier may be wearing #1 in Anaheim, as a large 1 is written on the chin of the mask. With all of the gradients and light flares, the paint effects throughout this design are a little too boardwalk airbrush booth-y in my opinion. In the meantime, we’ll be anxiously awaiting Gibson’s pixelated design––soon to come! We’re not worthy!! 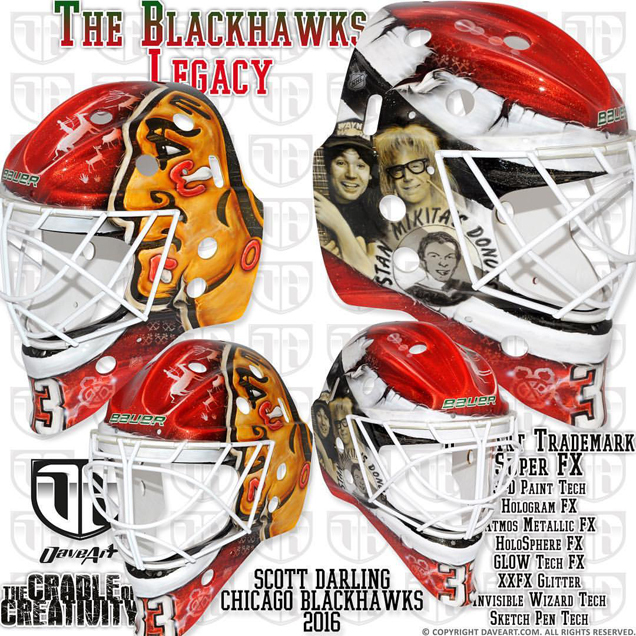 Ok, that joke’s been beat to dead, but Scott Darling’s new Wayne’s World theme mask really is excellent… (I’m sorry). 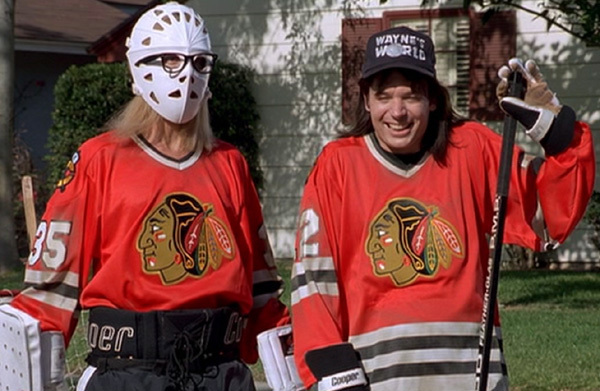 The Mike Myers cult favorite has been associated with the Blackhawks since the skit’s debut due to the characters’ suburban Illinois hometown and the Chicago jerseys frequently sported by Wayne and Garth. 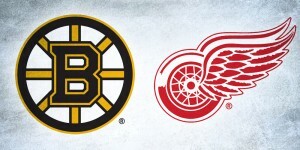 The duo’s “Game On!” saying even became the official slogan of the NHL back in the 90’s. 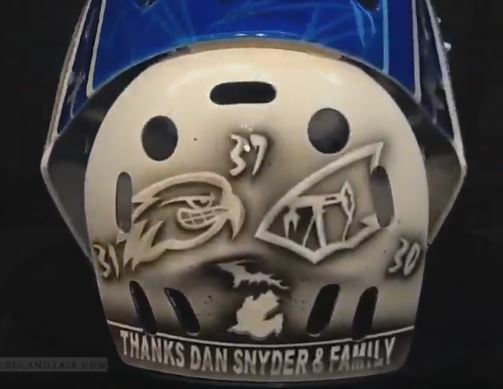 Blackhawks-Wayne’s World plays have popped up quite frequently in the form of jerseys and t-shirts, but this is the first time (at least in recent memory) that we’ve seen it on a goalie mask. 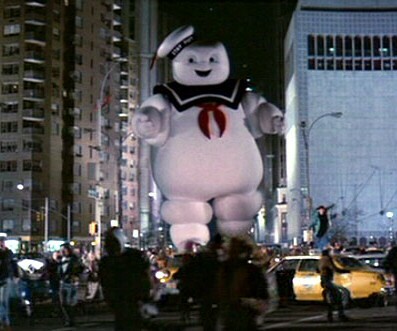 This season marks the 25th anniversary of the film adaptation, so it’s only fitting that Darling would pay tribute now. Dave Gunnarsson combined a photo realism style with the Hawks’ red, white and black stripes, depicting Wayne and Garth along with a logo for faux bakery, Stan Mikita’s Donuts, on the right side. The Blackhawks’ alternate logo along with Darling’s number 33 can be seen on the chin. 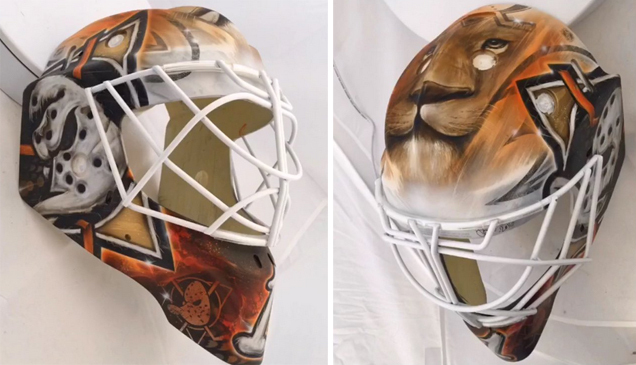 The left side of the mask is equally as COOL, with a close-cropped view of the Blackhawks’ logo in front of native american animal designs, making, as Gunnarsson described on Instagram “2 designs in 1.” This design is fun, nostalgic and beautifully executed, so party on, Darling… (ok, now I’m really done). 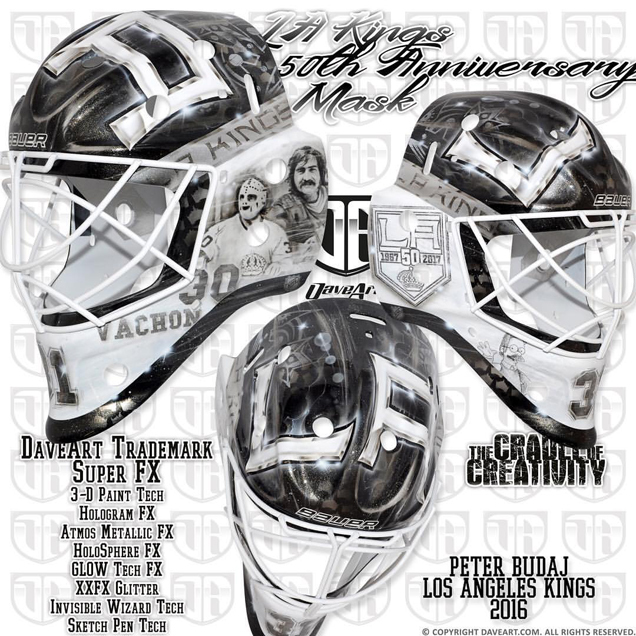 One of many team anniversary masks this season, Budaj’s Kings 50th bucket celebrates more milestone than one. “Peter Budaj and I have been working together for many years,” Dave Gunnarsson shared on Instagram. “Next year we celebrate a decade! That is 10 years of very exciting mask paintings.” The latest is no exception and pays tribute to some of the franchise’s best. “Peter knew what he wanted on his new Kings mask. A silent and calm design, old school and clean, with a tribute to the anniversary of LA Kings 50 years.” Kings legend Rogie Vachon along with his name and number are sketched on the left side of the mask opposite the team’s anniversary logo on the right. Also tucked into the white panel along the chin is Simpsons character Ned Flanders, a mainstay element on Budaj’s buckets over the years. The black and gray palette coordinate nicely with the team’s anniversary jerseys, even tying in the metallic trim in the chrome effects throughout. 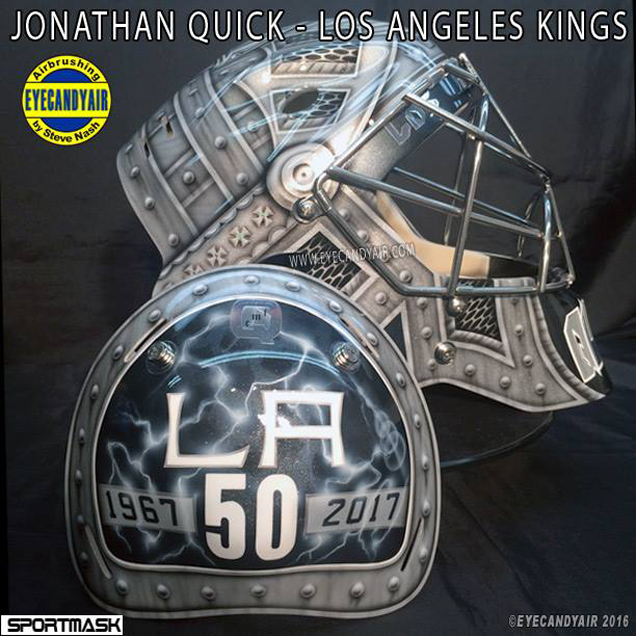 Budaj’s teammate Jonathan Quick also has an anniversary mask this season. Quick’s long time artist Steve Nash stuck with the battle armor motif that we’ve seen Quick wear over and over again, something the superstitious goaltender has yet to stray from in recent years. 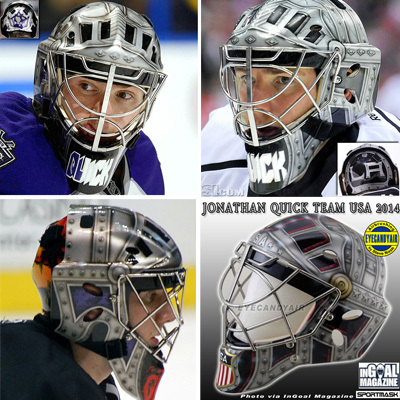 Jonathan Quick must be superstitious with his mask. Despite weakening strength for safety, he has not replaced his bent cage. The primary variation in this year’s iteration is on the back plate where Nash put the number “50” front and center, honoring the Kings’ half-century of history. Lightning strikes and light flares fill in the black background surrounded by silver bolted armor trim. 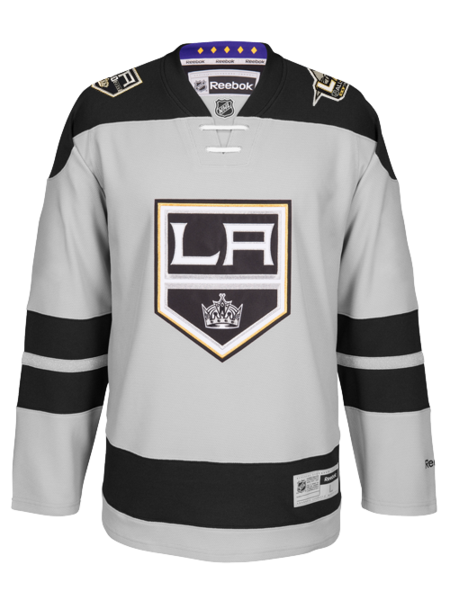 Like with Budaj’s mask, the silver tones in Quick’s will coordinate well with the Kings’ anniversary jerseys, as well as their standard black and white kits. Some purple and gold might be nice to see sooner or later, but given Quick’s track record in the battle armor, why fix what ain’t broken. 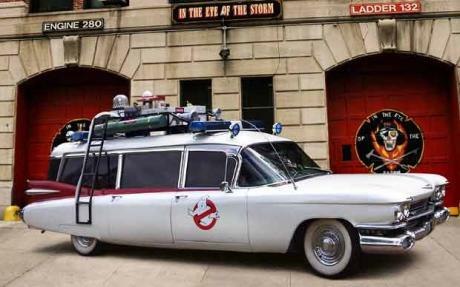 We’ve seen Dave Gunnarsson turn masks into vehicles like cop cars and fire trucks, but Cam Talbot’s new Oilers mask transforms into the Ghostbusters Ecto-1. 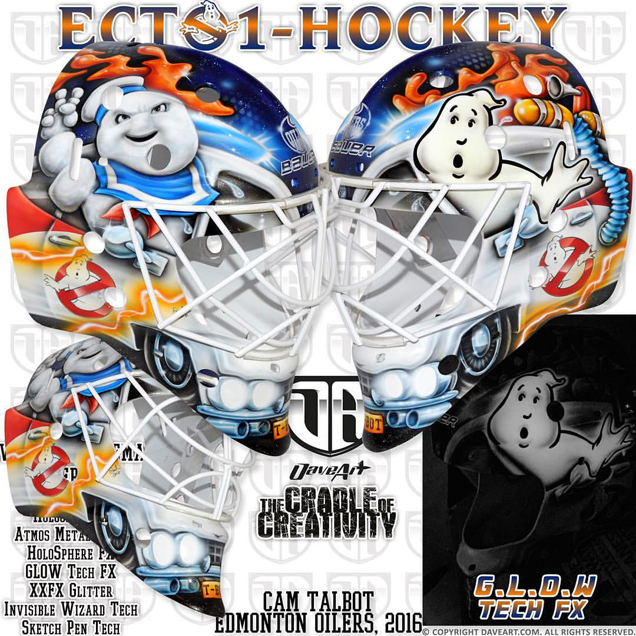 Having created Ghostbusters masks for Talbot in the past, this season’s iteration puts the Michelin Man and ghost front and center, operating the vehicle from each side. “They must have stolen the car,” Gunnarsson shared of the story behind the design. “I can tell you this, I had very fun when I painted and created this painting for my buddy Cam Talbot.” Small holographic oil drops fill the negative space to tie in the team identity, but this design all but screams Ghostbusters. 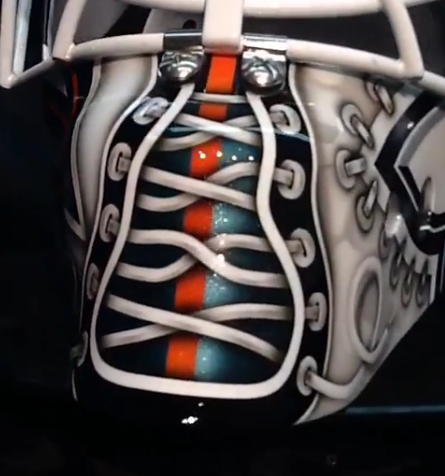 While it doesn’t say much about Cam or his team, this mask is well executed and really playful, so analyzing it for what it is, it’s a job well done. As Gunnarsson described, the take on the Calgary logo is the primary element in this design with yellow and white flames shooting out from either side. 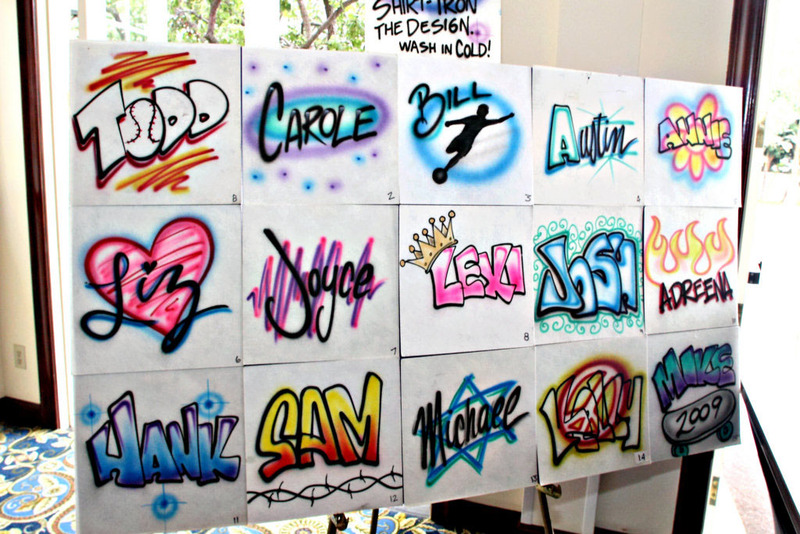 The inference to the bottom of the “C” is there on the chin with Ells’ nickname, “Moose,” written in between. 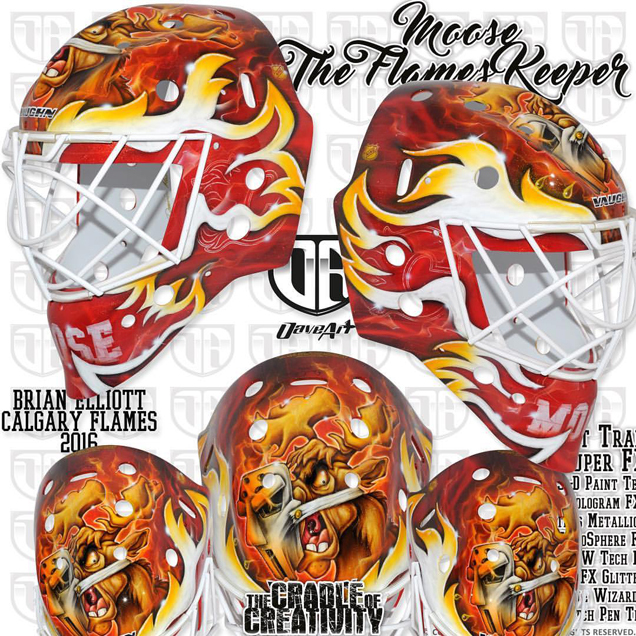 The top of the mask is where Elliott’s ever-present moose character makes an appearance, but my problem with this moose is that it looks more like a raging bull with antlers than an actual moose (trust me, I’m a Mainer–I would know). 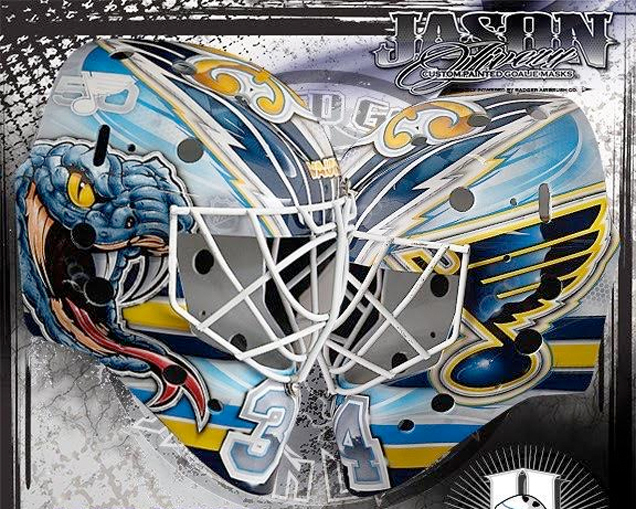 There’s no doubting Gunnarsson’s abilities, as we’ve seen him churn out one complex mask after another for years now, but the overall aesthetic of this one just misses the mark for me. As a Kings fan, I’m looking forward to trash talking the fact that Bernier is wearing our mascot on his bucket.